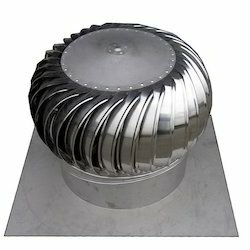 Manufacturer of a wide range of products which include stainless steel roof ventilator, roof ventilator, steel roof ventilator and aluminum roof ventilator. With firm commitment to quality, we are presenting for our clients a vast range of Stainless Steel Roof Ventilator. Designed by our skilled professionals using top notch quality stainless steel and innovative technology, offered roof ventilator is applied in different roofs in the scope of 0-22.5 oblique angle. In order to ensure its durability, this roof ventilator is sternly tested on various parameters by our quality controllers. Weather resistance and strong fray resistance, fine non-viscidity and self-cleanness, High revolving sensitivity and high air venting efficiency. Temperature difference between indoor and outdoor is 0.45C. It begins to revolve at the wind speed of 0.20 m/s. Applied in the different roof in the scope of 0-22.5 oblique angle. Industrial workshop, commercial and civil building. Being a well-established-organization, we are engaged in supplying a distinguished range of Roof Ventilator. Designed using top notch quality raw materials and cutting edge technology under the supervision of our adroit professionals, this ventilator is used in ventilating steep-slope roof assemblies to provide a means of allowing outside air to enter and exit attics. Highly appreciated for its unique features like functionality and low maintenance, offered ventilator is available for our clients at nominal prices. Applied in a different roof in the scope of 0-22.5 oblique angle. With the support of our experts and sophisticated in-house facilities, we have been able to offer an array of Steel Roof Ventilator. Applied in a various roof in the scope of 0-22.5C oblique angle and used in workshops and civil buildings, offered roof ventilator is manufactured using superior quality stainless steel and innovative technology. Available for our esteemed clients in various sizes and designs, this roof ventilator is in sync with set industry standards. These are applied in various roof in scope of 0-22.5C oblique angle and used in Workshops, Commercial and Civil buildings. Also, these are air venting efficient, weather and strong fray resistant and has sensitivity towards high revolving. It begins to revolve at the wind speed of 0.20 m/s. 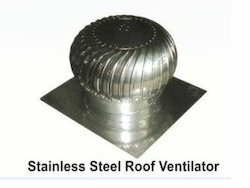 We are actively engaged in supplying an excellent range of Aluminum Roof Ventilator. We offered roof ventilator help to improve the ventilation in industrial establishment and help to create a congenial work environment. In line with set industry norms, this roof ventilator is manufactured under the vigilance of our skilled professionals using the best quality aluminum and sophisticated technology. Weather resistance and strong fray resistance, fine non-viscosity and self-cleanness, High revolving sensitivity and high air venting efficiency.